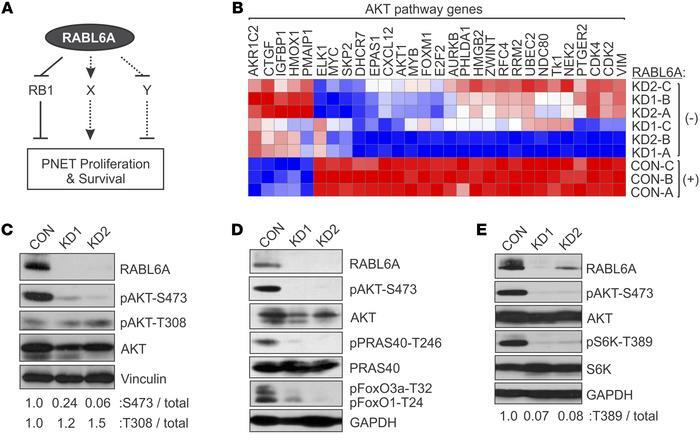 RABL6A depletion impairs AKT-S473 phosphorylation and AKT-mTOR signaling in PNETs. (A) Schematic showing that RABL6A promotes PNET cell proliferation and survival through multiple mechanisms, including inhibition of RB1 signaling as well as regulation of other undefined (X, Y) pathways. Arrow, activating event; perpendicular bar, inhibitory event. (B) BON-1 cells expressing vector control (CON: with RABL6A) or shRNAs targeting RABL6A (KD1 and KD2: without RABL6A) were examined by microarray analyses. Heat map shows that RABL6A depletion significantly alters the expression of genes involved in AKT signaling; data from 3 experiments, designated A–C. Genes were categorized by IPA software and displayed 2-fold or greater changes in expression (P < 0.05). Red, relatively increased expression; blue, relatively decreased expression. (C) Representative Western blots showing that RABL6A knockdown (KD1, KD2) in BON-1 cells specifically reduces the activating phosphorylation of AKT at S473, not T308. Vinculin served as loading control. Relative phosphorylation of each residue relative to total AKT was quantified by ImageJ. (D) Representative Western blots showing that inactivation of AKT in RABL6A knockdown BON-1 cells coincides with reduced phosphorylation of AKT substrates, PRAS40-T246 and FoxO1-T24/FoxO3a-T32, with GAPDH as loading control. (E) Representative Western blots showing that inactivation of AKT in RABL6A knockdown BON-1 cells coincides with reduced activation of mTORC1, as measured by decreased S6K phosphorylation at T389. GAPDH was the loading control. S6K-T389 phosphorylation relative to total S6K was quantified by ImageJ. Experiments in C–E represent at least 3 independent experimental repeats.